October | 2013 | justonemorebiteplease! I don’t care if people say that kale, similarly to bacon, has been over done. Who cares? They are both delicious – that’s why people use them all the time! Last night I made a really nice kale and squash soup, and this morning was really keen to use the leftover kale. It’s healthy (seriously, I’m pretty sure I can feel the antioxidants chasing cancer away) and I didn’t want to forget about it in the fridge over the course of the next week only to find it in a frightfully brown state. But what to make? The normal uses of kale drifted through my mind – kale salad, chips, sautéed with garlic… But then my thoughts stopped at the box of shells and cheese that has been taunting me for a couple of weeks. What’s not to like? Cheese? Good. Pasta? Good. Kale? Gooood. And maybe the healthy-ness of the kale could offset the plastic cheese! Such good intentions. Such an epic fail. The kale clumped together, a ball of green glued with sticky yellow/orange cheese. The taste was reminiscent of those Brad’s Raw Leafy Kale Nacho chips, which, as you may have guessed, aren’t exactly delicious. Not exactly spit them out gross, but not good enough to make the mistake of eating them again. The bright side? 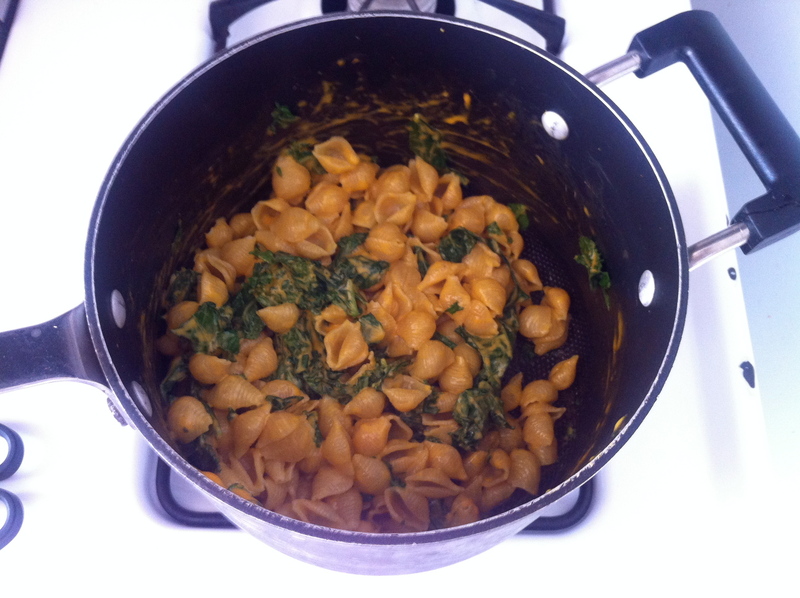 Since the kale didn’t really mix into the mac and cheese, I just pulled it out and had normal shells and cheese for lunch. Haha. Sad.